Leena holds an MA from Oulu University, Finland. She has been immersed in the field of language and communications as a language teacher, writer and translator. 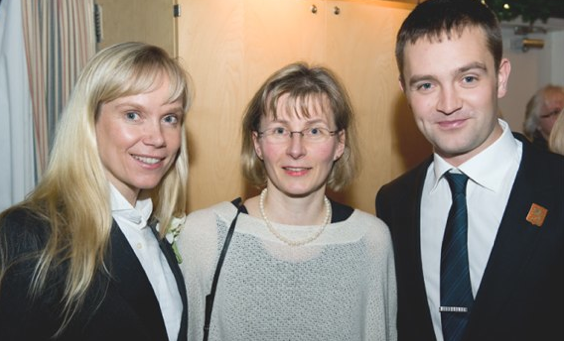 She is currently the Manager of the Scandinavian Community Centre in Burnaby, British Columbia, where she is also the librarian for the Vancouver Finlandia Club. The story of Leena’s great-uncle, the first officer to die in the Winter War, has served as an inspiration for the project. part time Broadcast and film industry studies in Canada and Finland. Ilkka has worked for the Finnish Broadcasting Company, David Suzuki Foundation and CBC Radio-Canada, Vancouver, among others. He has experience as a Camera Technician, Editor and Production Assistant. He is currently working full time in a visual effects studio in Vancouver. Ilkka is passionate about Finnish culture. His interests include videography and the visual arts, all technical aspects of video and audio production, documentaries, all year round sports, community and sustainable living. 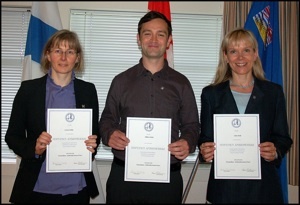 In April 2013, at the 40th Anniversary Celebration of the Finnish War Veterans in British Columbia, Leena Kelly, Ilkka Uitto and Satu Bell receive the Silver Achievement Pin for their work to preserve the stories of the war veterans.